Greenacre Writers has had another busy year, kicking off a 6-session ‘Life Writing/memoir’ course, led by Anna Meryt. The course covered planning the framework, characterisation, time frame, description and getting published. March saw Josie Pearse, of Pearse & Black, running Taking it Further. A one-off taster workshop for writers who are working, or thinking of working, on a longer project. In June the Finchley Literary Festival took place over a long weekend starting with a Memoir Writing Workshop again led by Anna, where we were treated to some interesting exercises and the differences between writing fiction and life writing. There were fund-raising activities beforehand, a short story competition launched in February and we were delighted when Joanna Cambell agreed to be our judge. One of the winning authors, James Woolf was able to attend the festival to receive his prize. Carol Sampson and Mr Greenacres encouraged local business people to either donate or sponsor the festival including Squires Estates and the Redwood Café. Finchley libraries supported the festival again. We held various events including talks by Harry Parker discussing his debut novel based on his army experiences. A.L. Bird, read from and talked about her fourth novel a psychological thriller. Allen Ashley, launched his latest book. Saturday morning saw Yvette Edwards, Irenoson Okojie, and Catriona Ward, who spoke about their writing process and held a lively panel discussion with questions from the audience. The ever popular Dragon's Pen with Gillian Stern, Cari Rosen and Antonia Honeywell gave local writers the opportunity to showcase their writing though we discovered one not so local writer had travelled all the way from Solihull. Saturday afternoon our Literary Delights included Joanna Campbell, judge of the FLF and Greenacre Writers short story competition, who announced the winners. Joanna then read from her latest collection of short stories and gave an amazing talk about the short story form and her first novel. Antonia Honeywell, author of the highly regarded novel, The Ship, and Rosie Canning discussed the literary representations of orphans in fiction with readings from classic and contemporary texts. Sunny Singh, author of three novels was interviewed by Lindsay Bamfield, talking about her extensive writing career and her influences. Vaseem Khan was our final speaker of Saturday and he spoke about his love affair with India and read from his bestselling debut novel. On Sunday, Katharine Norbury spoke about her memoir incorporating travelogue, mythology and nature writing. After hearing of Katharine’s exploits we were ready for our Guided Walk. Led by Mr Greenacres and Rosie Canning there were readings from books that mentioned Finchley with a lunch stop at Redwood Café (one of our sponsors) in Swan Lane Open Space, and a tea stop at Finchley Golf Club. Our final event was the Music and Poetry Palooza, organised by Anna Meryt, an evening of lively performance poetry and music supported as ever by Cafe Buzz. We were delighted that the BIG GREEN BOOKSHOP were the festival's book sellers. Our members have been busy with their writing and we are always pleased when they achieve success. FLF Coordinator Lindsay Bamfield had a flash fiction piece Bird Music published in The Great British Write Off Timeless Echoes anthology. It's been shortlisted in the GBWO competition too. Lindsay also edited Finchley Remembered II which was published in September. One of our newer Greenacre Writers, Marcelle Mateki Akita, recently released her debut collection of short stories entitled 'Lizard & Other Stories'. The collection focuses on girls and women of Ghanaian and mixed heritage. Allen Ashley has been very busy launching The Planet Suite and Slow Motion Wars – a short story collection co-written with Andrew Hook. Alan guest-edited a journal “Wordland 7: Mountebanks”. He was also named as “Barnet Eye Blog – Barnet Teacher of the Year 2016” and we offer him our hearty congratulations. Plus the Start that Novel course, and his new “Distance Group” that started November 2016. In April, June, October and November, Rosie Canning and Mr Greenacres led walks where they discovered woodland, a secret orchard, a viaduct, footpaths, green fields, brooks and literature! After all that walking, writing and poetry, there were of course lunch stops and afternoon tea at a variety of amazing cafes. Rosie Canning led a spring and autumn writing retreat at St Katharine's, Parmoor. Our regular groups continue to meet regularly, and there is also the the new Novel Focus Group starting in January 2017 and run by Allen Ashley - Subjects covered will include: Novel planning, Structure, First pages and chapters, Characterisation, Location, Dialogue, Pacing, Style and Editing techniques. If you are serious about settling into writing your novel, this is the course for you. February 2017, Josie Pearse will be working with a small group of writers, mostly novelists, serious about finishing a longer piece of work, who get together weekly in Central London (Tottenham Court Road). Josie hopes to move to Barnet in the New Year, and we look forward to hearing about more workshops and courses. Finally we had some wonderful conversations with writers including Alex Wheatle, the new Guardian children’s fiction prize winner, Rebecca Mascall, Yvette Edwards, Tasha Kavanagh, Kit de Waal, Harry Parker, Katharine Norbury, Louise Beech, Vaseem Khan, Joanna Campbell, some of whom went on to appear in the Finchley Literary Festival during June. We are thrilled that Finchley Literary Festival has been awarded 'Best event of the in Barnet' by the Barnet Eye Community awards for the second year running. For all the other categories and winners see The Barnet Eye Community Awards. Other published work includes: Carnegie’s Call (a non-fiction work about successful modern-day Scots); A Taste for Malice; The Guillotine Choice; and Beyond the Rage. His poetry includes: In The Raw, Running Threadsand Lip Synch. 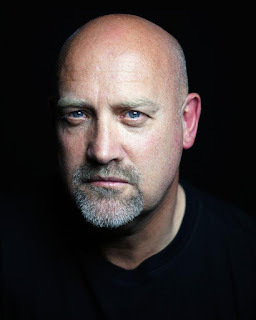 Michael is a regular reviewer for the hugely popular crime fiction website www.crimesquad.com. A former Regional Sales Manager (Faber & Faber) he has also worked as an IFA and a bookseller. 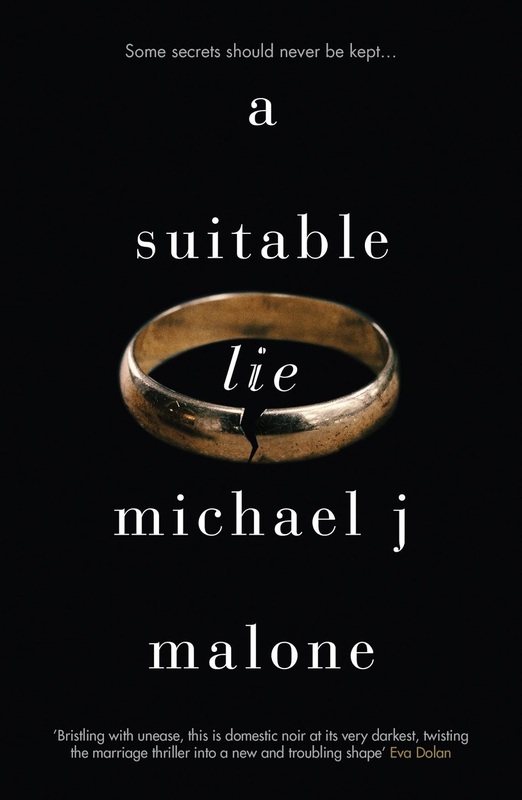 A Suitable Lie was recently published by Orenda Books in September 2016. A brave, deeply moving psychological thriller which marks a stunning departure for one of Scotland's top crime writers. We'd like to thank Michael for A Conversation with... and wish him huge success in the future. I remember holding a book as a small child and dreaming of the moment when I would hold one with my name on the cover. That dream was put on hold as life got in the way, but re-surfaced in my early thirties. I found myself saying over and over again – when I retire I’m going to write a book. And when I noticed what I was saying, I thought – why am I waiting? So, I began to practise and learn everything I could about the craft of writing. The full story of my road to publication would take way too long, so I’ll give you the abridged version. I joined my local writers club, had a go at various disciplines and found I had a facility for poetry. Over the next few years I had over 200 poems published in literary magazines, but the drive to see my name on a published novel didn’t subside. I started my first attempt at a novel in 1996 and eventually found a publisher in 2010. That novel, Blood Tears was released in 2012. It was a long and emotionally charged road, but well worth the sweat and tears in the final analysis. I’m a storyteller. My job is to entertain, primarily - to remove someone from their everyday into a world where their wants and needs are temporarily on hold while they are engaged in my fictive dream. If, while they are being entertained, they are gaining insight into other peoples’ lives, then that’s a bonus. What I like most about it are the days/ hours/ moments when I lose myself in that dream – wake up and find I’ve created something with just a few lines on a page. I think writing is an exercise in empathy and although I write crime fiction and there are a few “bad” people in there, I like to think there’s enough humanity in them to reach the human in me. I’ve written a series of novels about a tough Glasgow policeman and his criminal sidekick. Because it is such a masculine world I’ve been careful to ensure that my female characters are every bit as capable, perhaps more so, than the men around them. I’m a bit of a Francophile, so somewhere in France. I’m not fussy where to be honest. A location where I could ski in the winter and hang about a beach in the summer would suit me just fine. The answer to this one will change on an hourly basis. I’ve just cast my eyes over my bookcase, and I’ll go with The Power of One by Bryce Courteney. A brave little boy is brought up in an institution, he’s badly bullied, but never loses sight of his dream to be a world champion boxer. It’s a real Boy’s Own story and an inspirational tale. Just do it. I meet lots of people who say they’d love to write a novel - if only they had the time. If they really wanted to write one, they’d find the time. One writer I know had four kids and a demanding full-time job. He had forty five minutes for his lunch break and that was the only free time he had to himself throughout the week. Over the years he wrote 5 novels in those lunch breaks. That was a lesson to me when I met him and convinced me to somehow carve out the time, set up a work pattern and just do it. I’m currently putting the finishing touches to a couple of unrelated novels. One is a part of the series I mentioned earlier. It’s called Dog Fight and concerns my characters getting caught up in an underground fight club. The other is a gothic mystery about a lonely young man who inherits a sprawling mansion from a side of the family he had no idea even existed. I wanted to be Sparrowhawk – or Ged – the young wizard from A Wizard from Earthsea. I was such an ordinary wee boy, with nothing remarkable about him that I couldn’t fail to be drawn into a world where one such as I was harbouring such extraordinary gifts. It is just a normal day. Not quite like every other because Natalie and her nine year old daughter Rose are dressed in Halloween costumes ready for Trick or Treating, but normal in every other sense. Natalie is grumpy after spending hours carving the pumpkin and Rose is misbehaving. As they are verbally sparring in the kitchen Natalie is thrown into turmoil as Rose collapses. While waiting at the hospital a man in a brow suit, bearing military medals, chats to Natalie. She assumes he is dressed in authentic wartime clothing for Halloween. He is a stranger to Natalie but talking with him brings her comfort. When the nurse appears to speak with Natalie the man has disappeared. Rose is diagnosed with a serious condition requiring medication for the rest of her life. Rose rebels at this new way of life and Natalie must find ways to ensure Rose complies with her treatment. With her husband, Jake, away on tour in Afghanistan this presents Natalie with an exhausting challenge. In the coming days Natalie begins to dream of the sea and a man who feels familiar. It is only when Rose disappears and is found in the shed, explaining that the man in her dreams told her to go there, that Natalie realises Rose has seen him too. As the pain and inflexibility of daily treatment becomes a reality for Rose, she shuts Natalie out, refusing to accept this new way of life and Natalie becomes creative to meet the challenges her daughter sets. Through the telling of a story both Natalie and Rose become engrossed in the life of an ancestor, stranded at sea. The narrative switches between the challenges faced by their relative on the lifeboat and that of the daily struggle with Rose’s condition. The story stretches across the years as the man in the boat and Rose help each other to be strong. A bridge between the generations allow them to provide comfort to each other. Louise Beech has written a very powerful account of the suffering experienced by the seaman and his shipmates, adrift in the ocean, rationing out food and trying to stay alive against all odds. Meanwhile Rose and Natalie are learning how to cope with their new routine. 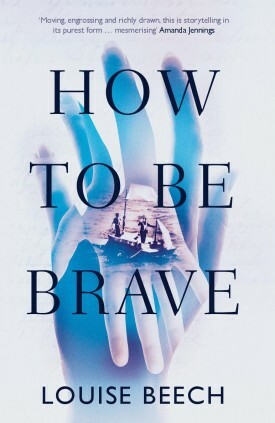 All are learning ‘How to be Brave’. The story is skilfully written, capturing the essence of human nature. It shows that it is not a weakness to accept the help of others and that we all need each other to survive. Life is not about facing challenges alone but that by allowing others to help, the suffering is eased. Natalie frequently suffers bouts of guilt. Firstly in not recognising Rose’s condition and then for losing her temper when tired and frustrated. Similarly, the man on the boat lost his temper, struck a young man when exhausted and weak, and regretted it until the day he died. Rose exonerates them both with her wise words. This captivating and moving story is well written, engaging and a delight to read. Inspiration for the story came from Louise Beech’s own experiences and makes compelling reading. Denise Brown was originally an Essex girl and is now settled in Dumfries & Galloway. Denise pursued her dreams of being a writer after a friend recommended she read JK Rowling’s Harvard commencement speech on the ‘Benefits of Failure’. She studied Advanced Creative Writing with the OU, balancing writing with a full-time job and being mum to five beautiful children. 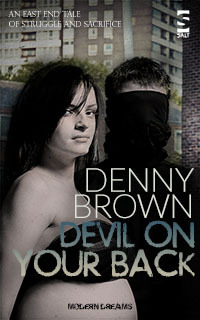 In 2014, Devil on Your Back, her gritty YA novella set in inner-city Britain, was published in ebook format by Salt Publishing. 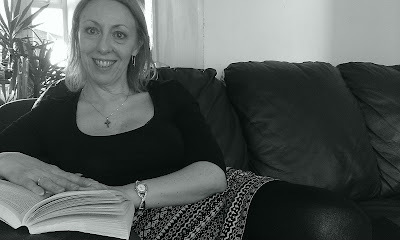 She has since had short stories published in Rattle Tales Anthology 4 and various online magazines, and was long-listed for the Mslexia novel competition with the first draft of an unpublished novel. Denise writes about things that disturb her. She once lived on a dismal estate similar to that featured in the forthcoming I am Winter, and made bearable only by the surreal effect of being surrounded by woods. It was the lack of hope in the faces of the local teenagers that were the inspiration for her novel. One day she wants to live in either a book shop or Hogwarts, with a Rottweiler and the complete works of Thomas Hardy. I think it all began with my dad. We used to go to the library together every three weeks when I was a teenager. I loved books. I always wanted to write but never considered it as a possible career so I left school, worked in a bank, got married and had lots of babies. It wasn’t until my youngest daughters were growing up that I decided to take the plunge and study (Advanced) Creative Writing with the OU. I was instantly addicted and started entering short story competitions – I won the first competition I entered which was a tremendous ego boost – and worked my way up to writing my first novella which was based on a short story submitted for one of my course assignments. When I saw Salt’s call for submissions for their Modern Dreams series I sent them my novella Devil on Your Back and three weeks later signed a contract with them. Seeing my photo on Salt’s website as one of their authors was so exciting! Since then I have continued working on several novels, been long-listed for the Mslexia novel competition and recently signed a contract with Cranachan Publishing so it is a very exciting time for me. I see myself as a crazy woman with lots of people living inside my head. No seriously, what I love most about writing is having a character that might begin as simply a face with a few freckles across the nose, and watching them develop into someone with history and passion, with likes and dislikes and family and friends, and a story to tell. Yes all the time! I think we all have the potential for good and evil; it is life that moulds us into the people we ultimately become, and it is the situations that people find themselves in and the way that they deal with them,that I tend to write about. Things that sadden or disturb me. We all know or have encountered a plethora of diverse characters in real life; it would feel unnatural to not carry this knowledge across into my writing. At home – I am exactly where I want to be because home is where my family is. The Secret History by Donna Tartt – thanks to my son Dan who gave me a copy for my birthday. It gets under your skin, slowly, subtly, unnoticeably at first, and then you feel as though you’ve become embroiled in a world so sinister and disturbing it cannot fail to go horribly wrong. 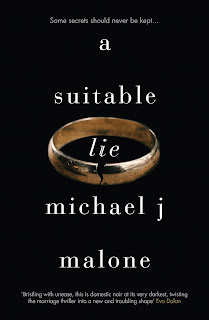 Immaculate writing and utterly un-put-down-able. Read, write, persevere, don’t give up. My first novel was attempted during Nanowrimo. I say ‘attempted’ because even though I completed the novel in the month, it wasn’t until I read it back that I realised how mind-numbingly awful it was. And still is. It’s unsalvageable but it proved to me that I could write a novel. I am Winter will be published late 2017 by Cranachan Publishing. It is a contemporary coming-of-age novel about Summer, a teenager whose mother’s tempestuous relationships leave her feeling unloved and abandoned until she discovers a bear-dog living in the local woods. I feel incredibly lucky to be working with Cranchan’s Helen and Anne to tell Summer’s story, as they share the same passions as myself about the novel. I’m not sure I have a favourite character from childhood. When I was fifteen I read Forever Amber and Amber St Clare remains to this day the character from a novel I would most like to be. The highly popular Writers in Conversation series returns to the University of Southampton with Costa Book of the Year winner Helen Macdonald headlining the autumn programme. The author of the bestselling H is for Hawk comes to the main stage of the Nuffield Theatre on Monday, 5 December. The book, a touching memoir of the year Helen spent training a goshawk named Mabel in the wake of her father’s death, won both the Costa award and The Samuel Johnson Prize in 2014. Helen is a writer, poet, illustrator, historian, naturalist and professional falconer. Throughout her career, Helen has worked as a Research Fellow at Jesus College, Cambridge and assisted with the management of raptor research and conservation projects across Eurasia and bred hunting falcons for Arab royalty. Writers in Conversation features some of today’s best fiction writers, poets, non-fiction writers and playwrights reading from their work and talking about their writing lifestyle. The talks are hosted by Carole Burns, a former journalist who still writes for The Washington Post. She is also a fiction writer, whose collection, The Missing Woman and Other Stories, won the John C. Zacharis First Book Award last year from Ploughshares. All Writers in Conversation events in the autumn series start at 19:30. Tickets for Helen Macdonald priced at £12.00 each.